Looking for great wedding day hairstyles? Brides have a lot to do for their wedding, so stressing out over how to wear your hair is a waste of energy. Sit back, relax and I'll help you find the right hairstyle for your special day. Since you have a lot to consider when choosing your bridal hairstyle, let's make it simple by taking it one step at a time. My first thought is – what looks best on you? If you have long hair do you look more beautiful with your hair up or down? If you have short hair do you prefer a soft, wispy look or do you prefer your hair to be gelled? You may want to select a hairstyle that reflects your personality. If you are a casual person that usually wears your hair in a ponytail or just natural, then you may want to keep your wedding hairstyle simple rather than go with a formal, perfectly coiffed hairdo. The hairstyle pictures on this page were created by Elizabeth from www.theupdoguru.com 732-904-0938. Brides should choose a style that compliments their face. 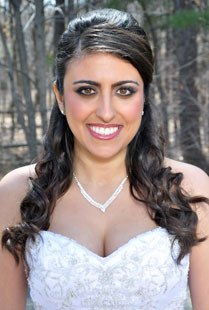 A bride that has an oval face has less to worry about; almost any style goes with an oval face. However, if you have bangs, be certain that you don't have too much hair covering your face. Square faces, look best with layered, wispy hairstyles or consider wearing your hair up to give you a heightened look. Round shaped faces should go for height and volume; this will help lengthen your face. Brides with heart shaped faces can choose a style that sweeps a small amount of hair across their brow to give them a more oval shaped look. What type of celebration will you be hosting? Will it be a formal or informal day time affair? Formal weddings tend to lend themselves to updos. Brides that are planning an informal party can choose to wear their hair down. 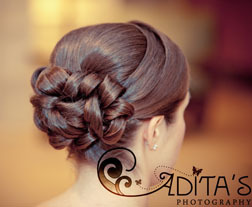 A bride's hairstyle should complement her dress and not compete with it. If you're wearing a strapless wedding gown you may want to wear your hair half up and half down to give your shoulders a more dramatic effect. If you're wearing a high collar dress, you may want to consider wearing your hair up so that your hairstyle doesn't compete with your dress and look like there's too much going on around your face. If you like a chic, modern look try slicking your hair back or have a sleek blow out. For Victorian or country weddings you hair will look great in loose curls with pearls or small flowers. If you have very short hair, consider using extensions to give you a more period look. Think of a tiara or jeweled hair accessories for a fairy tale, romantic wedding. A French twist or a bun at the nape of your neck will work well for a Disney wedding theme. Check the link below for fabulous hair accessories. For those brides that don't have a professional hair stylist ask other brides and your friends for recommendations. Look through bridal magazines, books and the Internet before you have your first meeting with the hair dresser. Bring pictures of hairstyles that you like with you so you at least have a starting point. Also, it's a good idea to bring a picture of your dress along with you so your stylist has an idea of what you will be wearing on your special day. Once you have chosen a stylist, have a contract drawn up detailing the cost, who will bring the accessories if you are using them, where and what time the stylist will begin doing your hair on your wedding day. Make certain the stylist has directions to where they will be doing your hair and if their transportation costs are included in the quoted price. Have the stylist's name written in the contract, I've seen brides disappointed on their wedding day because the stylist sent another person to style the bride's hair and that person was not as talented as the stylist that the bride had originally chosen. Wear a shirt with buttons so that you don't ruin your hairstyle trying to get your top off. It can be a few weeks between the time you choose a hairstyle and your wedding. Take a picture of the hairstyle that you have decided upon so you and the stylist will remember exactly which hairdo you choose. Check below for beautiful hair clips, combs, veils and other hair accessories at very reasonable prices. Whatever wedding day hairstyle you choose, be certain that you or your stylist practice doing your hair several months ahead of your wedding day. If you're wearing a veil make sure you have a way to secure the veil into your hair and that it looks good with the hairstyle and dress that you have chosen. Purchase your accessories (bobby pins, pearls, crystals, combs or hair sticks) ahead of time and do a complete check by putting your dress on and make certain that it all goes together and you feel beautiful. If you have a good stylist, stick with him or her; if not, start looking for a stylist at least five months ahead of your wedding. Let the stylist get to know you and your personality so he/she can make some suggestions. If you and the stylist aren't clicking, look for another person to do your hair. Remember to tip your stylist! I do hope these tips and pictures for wedding day hairstyles help you to find your perfect bridal look.